Day ten - time to rack to the carboy! Nothing too much of note here. 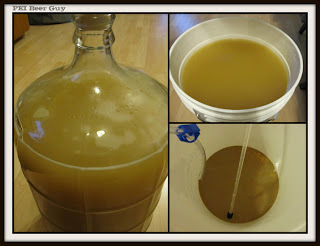 After I started the first step, fermentation was said to start within two days. After two days, I saw no action in the airlock and got a little concerned. I pulled the lid up and saw many bubbles rising (phew! ), and took a reading that confirmed things were under way. After that the bubbling / fermentation was pretty steady / active, right up until tonight. Phase Three coming up on the 28th! Hey, I bottled my first Twisted Mist last Wednesday. I made the strawberry/lime margarita combo. I have to say it turned out great! My wife and I have already gone through a few bottles already. I was a bit confused about the 2 yeast packages too, but called Noble Grape, where I bought it from, and they told me that Wine Expert found that due to the high final alchohol % that some of the kits weren't fully fermenting with the one yeast packet. Made sense to me, and like I said earlier I'm very happy with the results. I put on a Mojito too last saturday cause I know we're fonna drink alot of these babies over the summer! Hey, Jeff, thanks for the comment. I'm hoping that my mojito mix turns out really well, too. I'm glad some neglected-and-now-wild mint in the backyard spread out last year and is doing pretty well already! I'm curious to see how well the whole mix clears up when I put the next two bags in plus the isinglass. Did you know that stuff is made from the swim bladders of fish? True story.